Read four young adult, vampire stories that will leave you wanting more…Each woman has a destined fate and an extraordinary story to tell. Jump into this adrenaline-packed, supernatural thriller from USA TODAY bestselling author Chrissy Peebles. I was born to die... But to defy fate is to control your own destiny. Little did I know that I was entering a world of ritual and magic and that my blood needed to be spilled so the witches’ legacy could be complete. Vampires. Witches. Werewolves. Supernatural Creatures. Dramatic Revelations. A Ritual Sacrifice. Ancient Artifacts. A Cold-hearted Serial Killer. Spilled Blood. Secrets. A Hidden Heritage. A Love So Deep. Supernatural Bloodlust. A Dangerous Curse. An Uneasy Alliance With A Dangerous Vampire. What if courage was your only option? When Kallie lands a college interview with the city’s new hot-shot police officer, she has no idea everything in her life is about to change. The detective is young, handsome and seems to have an unnatural ability to stop the increasing local crime rate. Detective Liam’s particular interest in Kallie sends her heart and head stumbling over each other. 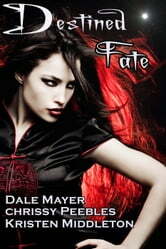 When a raging blood feud between vampires spills into her home, Kallie gets caught in the middle. Torn between love and family loyalty she must find the courage to fight what she fears the most and possibly risk everything, even if it means dying for those she loves. Good story ! Not enough romance.